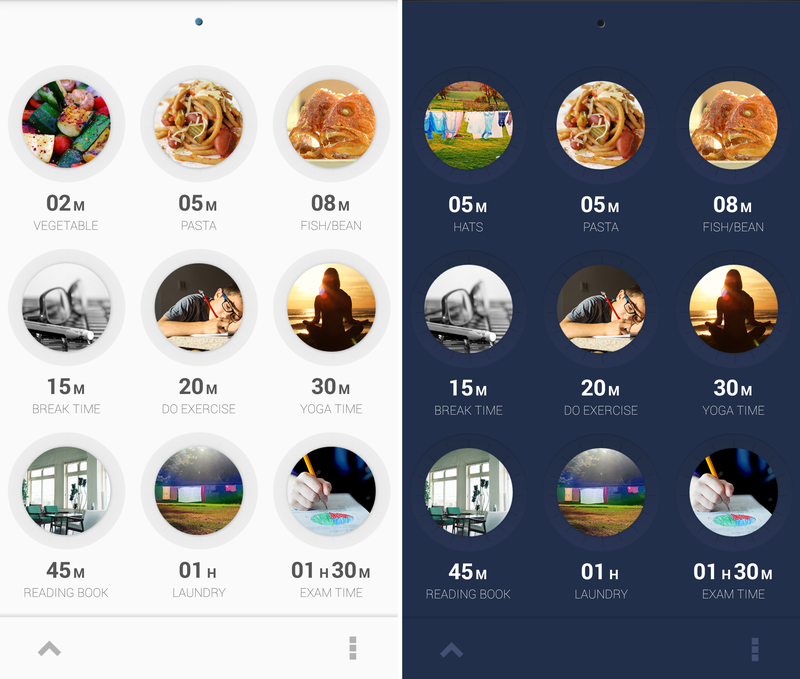 When it comes to timer apps on Android, there’s not really any shortage to choose from, but Wonder Timer is a simple, attractive new entrant to the Play Store, so we thought it well worth shining a spotlight on. It’s also free. It’s a little rough around the edges in places, but Wonder Timer shows promise, provided the devs continue to add new features and squash bugs. Head to the Play Store and download the free Wonder Timer app. That’s actually about it. Unlike seemingly every other app nowadays, there’s no need to create an account or connect it to your social networks – a sad state of affairs for people that like to share the minutiae of their life, but a welcome breath of fresh air for me. The main screen is comprised of nine pre-set timers ranging from two minutes to an hour and a half. 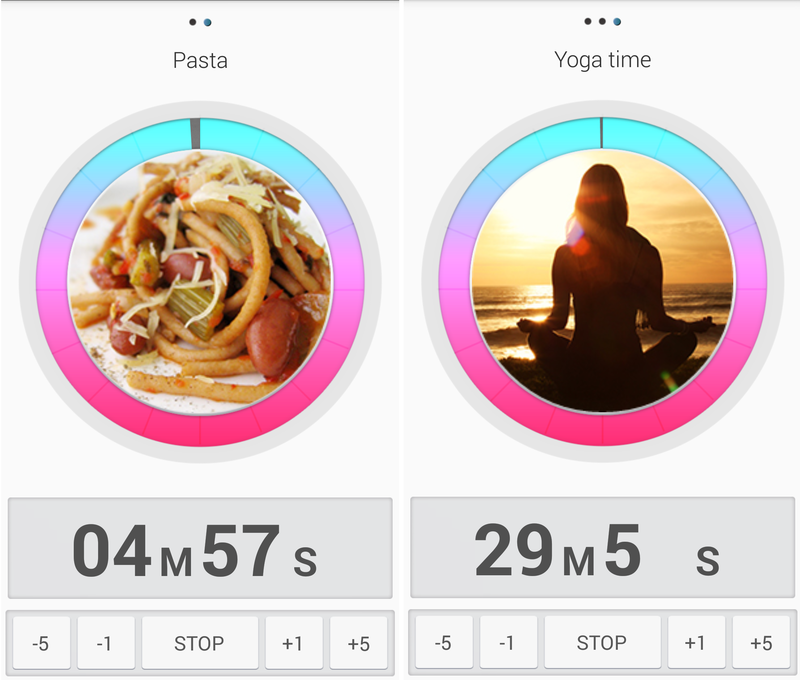 Each of these comes with its own category name, like Pasta, Yoga, Break Time etc., but you can also use these pre-set timers as a basis and then tweak the names and image as you want. By default Wonder Timer starts with its ‘light’ theme but there is a ‘dark’ option in the settings menu too. If you’re not a fan of the photographic images, there’s a wealth of icons to choose from instead, covering a whole range of activities. 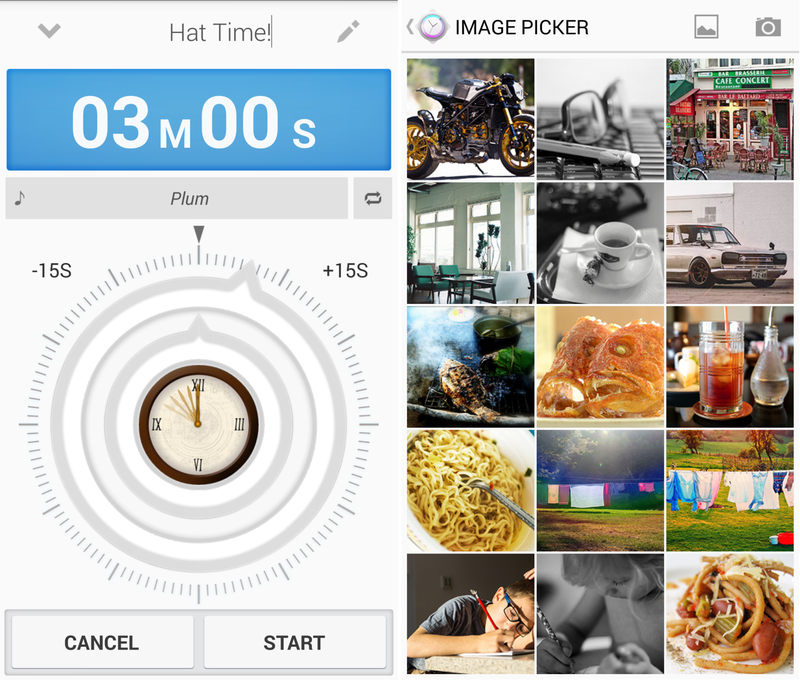 Of course, you can also set up your own manual timer – including setting your own image and alert tone. Moving the outer ring (image above-left) controls the number of minutes and moving the inner ring sets the hours. Tapping the image in the center allows you to set a new picture, and pressing the pencil icon at the top allows you to set a name for the alarm. Beneath that is where you can select what sound you’d like to hear when time’s up; again, there are pre-set options or you can choose from your own on-device music. Then all you need to do is press start. There’s a problem though. It seems there’s currently a bug with manual alarms for devices running Android 4.3+. The result is that if you set one up and hit start and then don’t try and view it or add another manual alarm, it will work fine. If however, you do try to do either of those two things, it just disappears and presents you with a fresh alarm. The set timer also doesn’t appear in the side-scrolling list of live timers (indicated by the dots in the images below). As a result, until it’s fixed (we’d expect this to happen very quickly), it’s easier to use a pre-set alarm and then just change the time, title and picture to your needs. We did manage to verify that the manual timer setting works just fine on devices running Android 4.2 though. Happily, there’s no problem with using the pre-set ones, and you can run multiple timers alongside each other. To view them, you simply swipe left or right from the main list of pre-set alarm options. You can also tweak a running timer by tapping the + or – minutes buttons (shown above) without needing to stop it, although if you want to add more than 5 minutes, you’ll have to just tap it multiple times. Similarly, you can add extra time to an alarm when it is going off by hitting the +5 or +10 minute buttons. To save having to check when your next timer is due to go off, the Android notification bar keeps a persistent reminder telling you exactly when it’s due. Let’s be honest, it’s not going to change the world is it, but I frequently find myself needing to set timers here and there – and there’s no reason they shouldn’t look a bit more interesting than a plain old clock and come with some options to add a few more minutes when necessary. Plus, the app’s free. 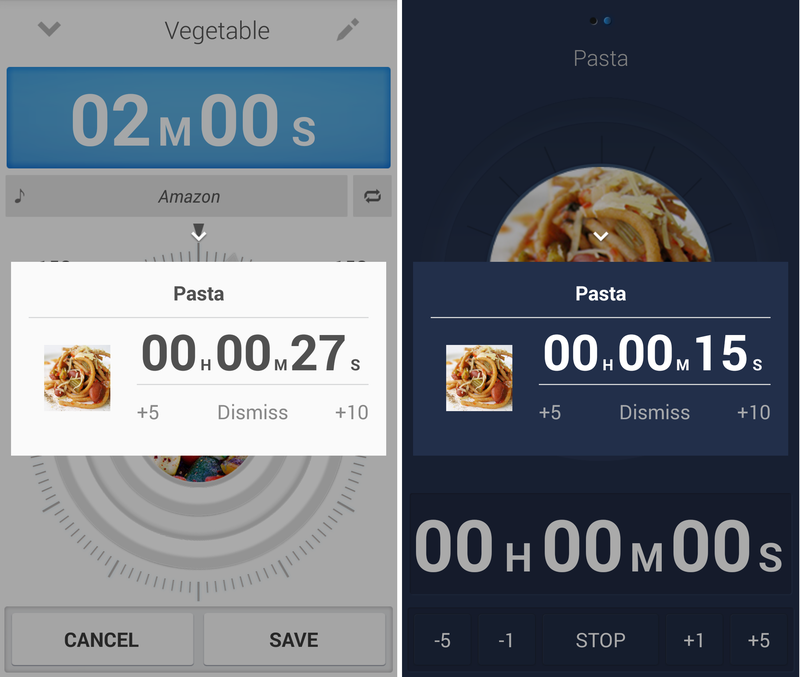 Provided the team behind the app can quickly get the manual timer set-up functioning more reliably, this stands a chance of becoming my go-to app for just those moments. One thing I would like to see added though is the option to set a timer by voice, then Wonder Timer truly will stand a chance of luring me away from the efficient simplicity of using Google Now instead.